Homemade Crunchy Baked Fish Sticks are made using fresh fish fillets that are cut into strips, coated in seasoned panko breadcrumbs, then baked in the oven until they are perfectly crispy on the outside and tender on the inside. When I was growing up, frozen fish sticks were one of the regular meals in our family's dinner rotation. Occasionally my Mom would make fresh catfish nuggets, but the frozen guys were the norm. While I wasn't a seafood fan at the time, there's something very kid-friendly about foods in stick or nugget form, so I ate them happily dunked in ketchup. Now that I'm a mom, I started buying bags of frozen fish sticks when they would go on sale for quick lunches or dinners for my kids. They, just like their momma, scarffed them right down with no complaints. It wasn't until the other day that it dawned on me to make my own fish sticks at home. My step-dad is an avid fisherman and catches boatloads of fish on his excursions through the flats of the Intracoastal Waterway. Sometimes, when I'm lucky, he shares some of the fillets from his fresh catches. I ususally freeze what he gives me to make for myself, since my hubby's not a big fan of seafood. The other day he gave me a gorgeous fillet and my mom suggested I make fish sticks with it. I thought to myself, huh....why haven't I done that before? So I made them. Holy delicious homemade crispy baked fish sticks, batman. I mean they were good good. The best part? They took like 10 minutes to throw together and the kids LOVED them. Bye bye frozen, hello fresh! My daughter couldn't get over how they were super crunchy on the outside and soft on the inside. Perfect! You will love these, guaranteed! I can't wait to make them again. Preheat your oven to 450 degrees. Line a baking sheet with aluminum foil and drizzle it with 2 tbsps of the olive oil. Place the flour, eggs, and panko combined with the seasonings into three separate bowls. Dredge each piece of fish into the flour, shaking of any excess. Then dip the fish into the egg, followed by the breadcrumbs, firmly pressing the breadcrumbs onto the fish. Repeat for all of the fish pieces and arrange them onto the prepared baking sheet. 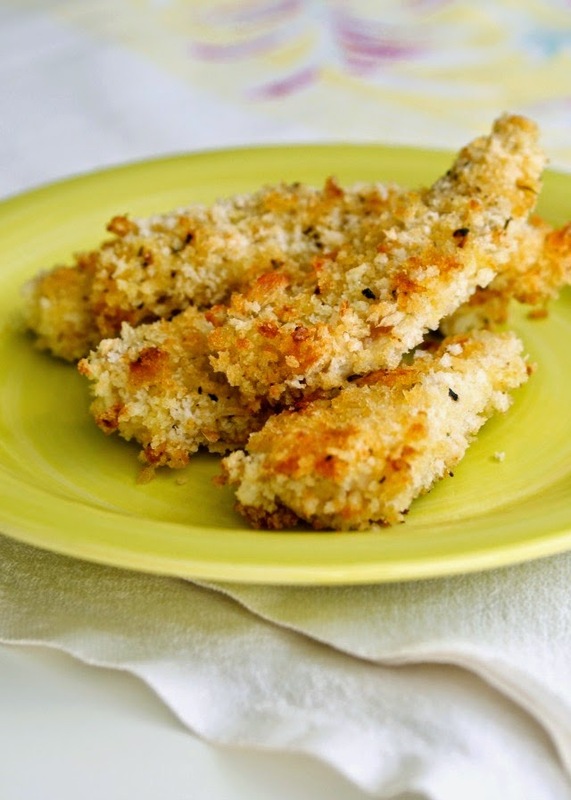 Drizzle the breaded fish sticks with the remaining tbsp of olive oil. Bake in the preheated oven for 10-12 minutes, flipping once halfway through the cook time. Fish with be opaque and flaky when done. Source: Adapted from Yankee Magazine. Think ahead! Make a big batch and transfer the finished fish sticks to the freezer while they're still on the baking sheet. Once frozen, put them into a ziploc freezer bag. Voila! Frozen fish stick that are way better than store-bought!